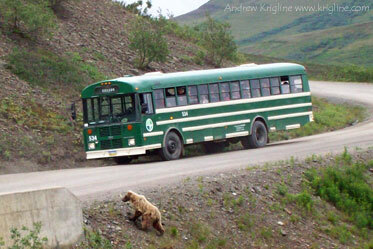 In Denali National Park, cars are only allowed in the first sixty miles or so; the government runs a bus service on one of the few roads, and we saw many things on our day-trip into one of America's most "natural" and undisturbed preserves. The next-to-last photo was taken at the "animal hospital." The last photo (of Andrew sneezing!) 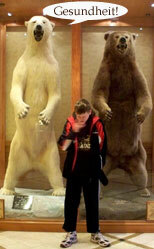 shows how big these bears really are. 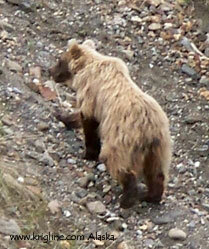 We watched this bear for quite a while; those in the other bus got even closer photos! 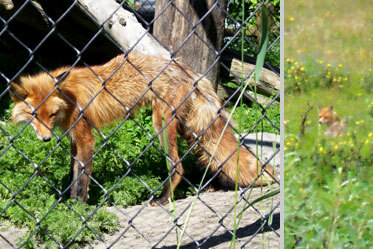 Next to the "hospitalized" fox there's a picture of one we saw in person. Buffalo or bison at the "hospital." These huge animals were once hunted to almost extinction, but they have made a big comeback. 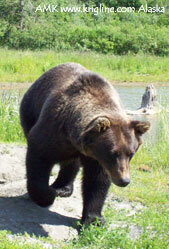 Some are even raised domestically for food and fur. I saw mountain sheep/rams much closer in Yellowstone National Park, but my brother got this VERY distant shot with his long lens. 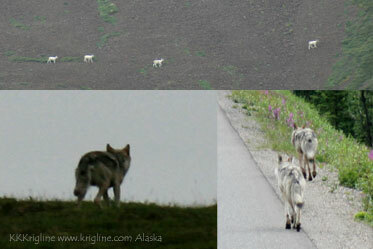 He and Fran were also the only ones who saw wolves in Denali. We saw several moose (mooses? meece?) 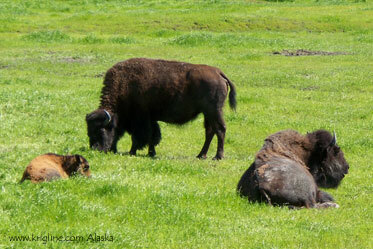 in Denali; they are also huge. 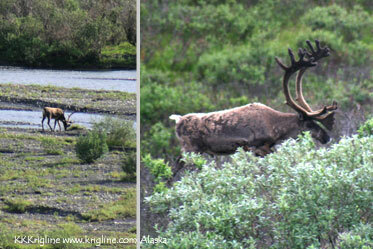 The reindeer are being raised domestically, and we saw them on the paddleboat tour. 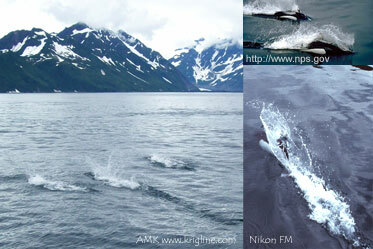 Again, Kevin's long lens produced the best photos of these distant animals. 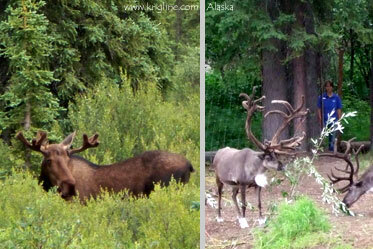 I think the one on the left is a caribou and the other is an elk, but I'm not sure! Since most of Alaska is covered with snow most of the year, dog sleds have long been used for winter transportation. 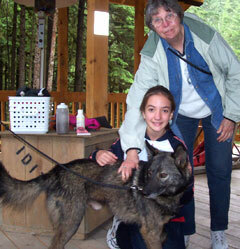 There is even a famous, grueling race called the Iditarod. Of course, training is a year-round process, and we got to see several "working exhibits" like those shown above; these hard-working dogs also love to meet new people (like Michael's mother and niece in the last photo). 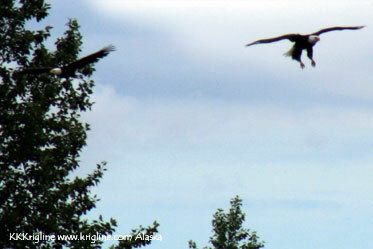 We saw lots of eagles in Alaska, but of course it is hard to get photos! They fly very high, and (except for the "bald" head) sort of blend in with the background. 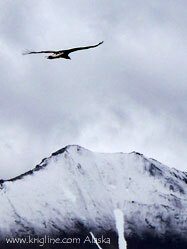 Notice that there are two flying eagles in the first photo (the other is in the tree). 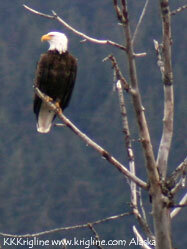 The bald eagle is another animal that has made a come-back from the "endangered species" list. 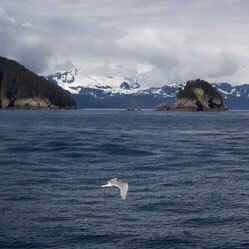 Rock islands, like those shown in this picture, are home to many types of birds. 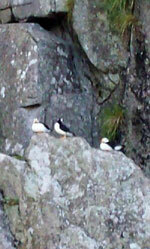 They nest in the rocks, and I can only imagine what this precarious home is like in bad weather! 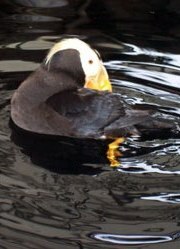 Below you see sea gulls, a cormorant (I think) and puffins. 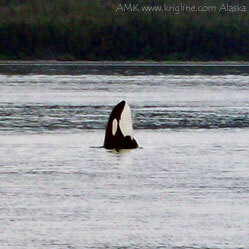 The whales were my favorite animal to watch, perhaps because I'd never seen one in the wild before. 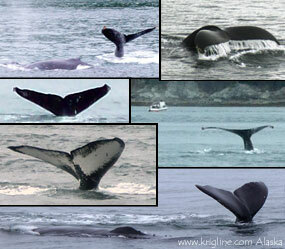 Obviously I wasn't the only one, because I had to choose from over 200 whale photos! 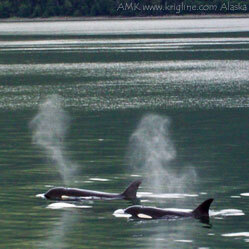 These are Orca whales, sometimes called killer whales. 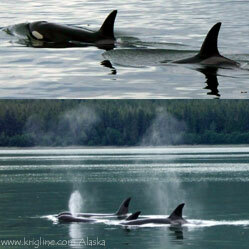 In fact, the middle picture shows what they do to celebrate a kill (according to our guide). 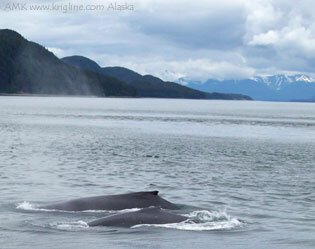 Whales are mammals, so they breath air; the spray from their blowholes makes them visible from a long way off. This was great for us (and our sightseeing-boat captains), but it also made them easy to hunt (which is no longer allowed in most countries). 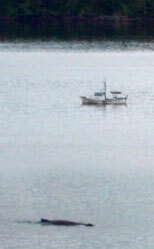 The first photo shows how big a humpback whale is, in comparison to a fishing boat. Most of the time, all you can see is their "humped" back and the spray from a blowhole, but just before they take a long dive (sometimes for half an hour!) you can also see their tails. The last group of photos is some of the tails we caught on film. 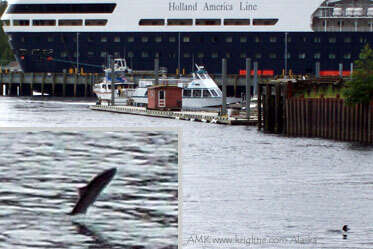 Click here to see a bigger Humpback whale tail. I would have called these "seals" but I think the real term is "sea lions." 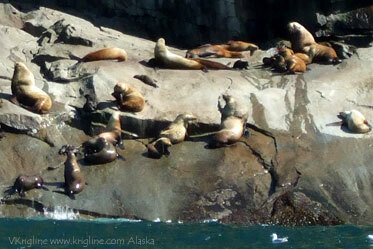 This is part of a wider shot with over 100 sea lions basking in the sun. Salmon fishing and canning is an important part of Ketchikan's economy; we saw these fish jumping in the river that runs through town. Salmon have the interesting instinct to return up-river to their birthplace in order to lay eggs; this draws bears to the rivers because the jumping salmon are pretty easy to catch!  For our policy regarding copying or using photos/materials on this website, click here. For more photos from (and a map of) the USA, click here. 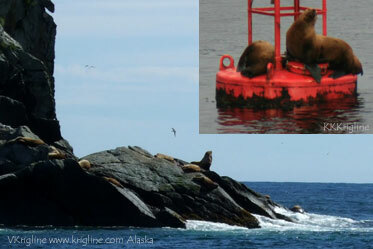 Our main Alaska pages: trip&ship animals scenery and wide panoramas cool stuff Click here for the "camera types" used.